Celestron představil novou paralaktickou německou montáž, nahrazující model CGE, vhodnou pro jeho dalekohledy od průměru 8” až do 11”. 2" nerezové nohy, výškově stavitelné se stupnicemi na stojnách pro snažší nastavení shodné délky stojen. Celestron redesigned the CGX mount with both the visual observer and astrophotographer in mind. The engineers at Celestron had a goal, and that goal was to create a German Equatorial Mount, or GEM, that had a generous load capacity, tracking capabilities that would please advanced astro-imagers, and software that could allow for remote operation. However, knowing that most amateur astronomers still love to travel with their telescope to visit dark sky sites, the new mount had to be reasonably portable. Enter the Celestron CGX GoTo Equatorial Mount! To make the CGX strong yet portable, Celestron engineers started by making the mount slightly shorter and a tad more stout. This lower profile design makes for a more compact, yet more stable mount. Next, they took some of the weight out of the CGX by removing bulk where it was unnecessary and using metal ribbing to strengthen the design as a whole. These changes resulted in a mount with lower dampening time and a very nice weight capacity to mount weight ratio, with a weight capacity of 55 pounds and a mount head weight of 44 pounds. With the new CGX, you can easily load an 11" OTA with lots of accessories and still be under the capacity limit; and since Celestron was conservative with the max load numbers, you should be fine if you go over a little. Need to operate at extremely low latitudes? No problem! The CGX mount can easily operate at 3 degrees to 65 degrees latitude. The equatorial head of the mount can be adjusted to optimize the position of the mount so the center of gravity is over the tripod. The head can slide forwards or backwards to achieve this goal, and allows for a latitude range that is unheard of for most equatorial mounts at this price point. 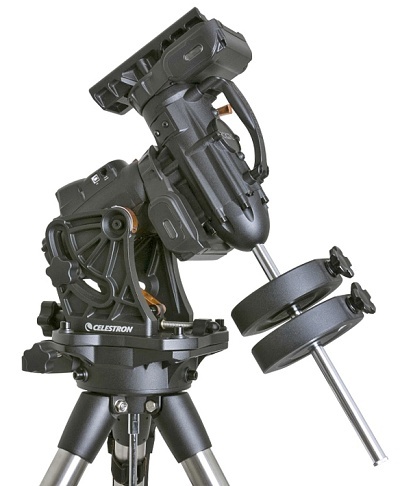 The Celestron CGX mount has two ergonomically placed carry handles. These handles make the mount much easier to carry and/or load onto the tripod. Just keep the mount close to your body when you move it, and the weight will be distributed correctly and feel lighter than it is. Celestron also beefed up the RA and DEC lock knobs as well as the latitude adjustment knobs. In fact, you will be able to polar align with ease due to the Acme threads and Teflon bearing that were added to the adjustment knobs. Even under load, the knob's movement is buttery smooth. It's little things like these that add up to a faster set-up time and a more enjoyable observing session. The CGE equatorial mount comes with a heavy-duty belt drive and pulley system to minimize backlash and offer smooth, quiet operation. Using a belt and pulley system was a first for Celestron, so they did stress-tests to make sure they chose a belt that wouldn't stretch or slip, and would perform to their expectations. The motors themselves have been upgraded to provide more torque, resulting in better tracking and slewing. Finally, a spring-loaded brass worm gear and stainless steel worm gear produce optimum meshing of the gear teeth, which also increases tracking and slewing performance. There is even a clear window built into the motor covers so you can see the belts and pulleys at work. Many astronomers today have a backyard or dark sky observatory, and want the ability to control their telescope and camera remotely from the comfort of their living room or warm room. Celestron designed the CGX Mount to work remotely by adding mechanical features as well as state-of-the-art built-in telescope control software. Home sensors allow the telescope to always start in the index, or home position, even if you lose power when the mount is pointing to a different area of the sky. With the push of a button, the CGX mount will go to its designated home, and remember its proper alignment and settings. Tracking past either side of the meridian is very desirable for astro-imagers. The CGX will track up to 20 degrees past the meridian on either side, and when it reaches that limit, it will automatically stop slewing before reaching the built-in mechanical hard stop fail safe. These features prevent excessive cable tension and allow you to work on site or remotely without worrying about your scope crashing into the tripod legs. In fact, most of your cabling will be safe regardless, because the RA and DEC cables are located inside the mount to eliminating twisting, stretching, and disconnections. Polar alignment is a snap with the built-in All-Star Polar Alignment software on the CGX mount. Choose any bright star in the sky to align on, it doesn't have to be Polaris. The CGX mount will slew to the star's position in the sky, and then all you have to do is use the alignment knobs to center the star in your eyepiece. No drift alignment is necessary. There is no need for a stand-alone polar scope, however, if you prefer one, Celestron will be offering a special CGX Polar Alignment Scope as an optional accessory soon. Speaking of accessories, go ahead and use the Celestron StarSense or Celestron WiFi modules with the CGX; they're compatible. In fact, the CGX mount has two ancillary ports, a USB port, and an AutoGuide port so you can make use of several trusted accessories. A PC port is also available for direct connection to your computer, where you can use The Sky or other planisphere software to control your mount. The CGX has professional level software built right in. 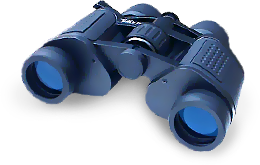 The control software was developed in conjunction with Planewave, a manufacturer of quality observatory-level telescopes. This software offers multi-point mount modeling to achieve super accurate pointing. It can also control a motorized focuser should you decide to add one, and offers plate solving for your imaging camera when used in conjunction with MaximDL, which is sold separately. The Celestron NexStar + hand controller has been upgraded to include a USB port at one end, which means you no longer need a RS232 to USB Adapter. With the push of a button you can visit over 40,000 objects, see the best objects in the sky with Tour Mode, polar align your telescope, and more. The dual line, 16 character LCD screen is easy to read, and the large buttons on the face of the controller are illuminated with an adjustable soft glow to make it easy to operate your mount in the dark. The NexStar + Controller is flash upgradeable, and you can always find the latest updates on the Celestron website. Stop worrying about whether your OTA will fit the saddle of your chosen mount! The Celestron CGX now comes with a very beefy dual saddle plate. It will accept Losmandy-style (CGE) or Vixen-style (CG-5) dovetail plates, as well as dovetails from AstroPhysics, ADM, and more. The CGX Tripod has been improved in several ways. The tripod legs spread out wider for extra stability, and the 2" diameter steel tripod legs have graduated index marks down their length so it is easier to level the tripod. The tripod leg lock knobs face inwards instead of outwards so you won't be as likely to catch a power cord or your pants leg on them. Finally, the tripod spreader/eyepiece tray can stay in place when the tripod is collapsed for storage or transport. When in position, the tray holds three 1.25" eyepieces, two 2" eyepieces, and a smartphone or other small accessories.